Mountainview Elementary School is committed to developing the academic, social, and emotional potential of all our students. This is achieved by providing a caring and welcoming environment for all our families. Community partners and parents work together with staff, to support and challenge all children to achieve their full potential. Our motto "Mountainview Cares" represents our core belief that children will learn best and flourish in a caring environment, and that teaching children to care, will benefit individuals and society. Our motto embodies all aspects of our school experience. Mountainview Elementary School was established in 1960 as St- Eustache sur-le-Lac Elementary. It was renamed Mountainview Elementary in 1973. While located in Deux-Montagnes, Mountainview also serves the population of St- Eustache, Oka, Saint-Joseph-du-Lac, Pointe-Calumet, Saint-Augustin, Saint-Benoit and Sainte-Marthe-sur-le-Lac, as well as a small corner of Mirabel. Many of our 275 students have parents who graduated from Mountainview - we are truly a community school. In 2007 Mountainview was named by Today's Parent as one of Canada's top 30 schools. In 2013 We won the Jasmine Roy foundation award and in 2014 we won the GRIS Simple Plan award for our pioneering work against bullying through our Week Against Homophobia Program. The Mountainview Elementary School Governing Board meets 5 times per year and the Mountianview Home and School Association meets one time per month. We have an extremely active volunteer program, with about 2 000 hours of time donated each year by parents, grandparents and community members. Our Home and School fundraising activities contribute thousands of dollars every year to the extracurricular, co-curricular and educational activities of the school. Over the last 5 years Mountainview has been steadily increasing the classroom technology availability to our students. All elementary classrooms have a smartboard: As of Fall 2013 all of our Kindergarten, Cycle 1, 2 and 3 classes have a smart board. Apple TVs: Kindergarten classrooms and our Music room, and Daycare have HD wide screen TVs with Apple TV. KinderTech: In addition to the HD screens, with a dedicated laptop, Kindergarten also have networked computers, dedicated ipads and a smart table for regular student use. Laptops and Chromebooks: All students in cycle 3 have either a chromebook or a laptop. iPads: Mountainview currently has 32 ipads (not including dedicated ipads for some students). 12 of the ipads are dedicated to our Kindergarten students, the other 20 are shared by the Cycle 1, 2, and 3 classes. We are Leaders in Education and Pedagogy. Mountainview continues to participate in partnerships with McGill and Concordia for both the training of teachers and for pilot research projects. Mountainview Daycare is a MEES-regulated service which cultivates and nurtures positive relationships between members of the Daycare staff, students and parents. The Daycare offers activities such as sports, arts & crafts, games and special activities to all our daycare students while providing time for reading and outdoor play. Pedagogical days include in-school and fieldtrip activities. Terry Fox Run: Mountainview students participate in the annual Terry Fox Run. Remembrance Day Celebration: Students brought in donations for poppies distributed by two active Canadian peacekeepers. Christmas Food Drive : Every year boxes of food are donated from Mountainview families to Agapé. Kindergarten 100th Day of School Celebration: Kindergarten students brought in and donated 100 cans of food to Agapé. National Denim Day : Students and staff contribute funds to be sent to the CURE Foundation. Week To End Homophobia: Students and staff participated in a school wide week of activities designed to end homophobia in our schools and in our society. The Mountainview House System began in 2010-2011. Similar to that seen in Harry Potter’s Hogwarts, Mountainview students have been divided into four Houses. Each House has students from Kindergarten to Grade 6. This new system is part of our continued positive behavior program, and will encourage students to form positive relationships with fellow students in different levels. Throughout the year, students earn House Points in class, during assemblies, at daycare, on the bus, and on the playground. Points are given for positive behaviors such as cooperation, kindness, good sportsmanship, tolerance, respect, effort etc. The houses were named by a democratic vote of members. 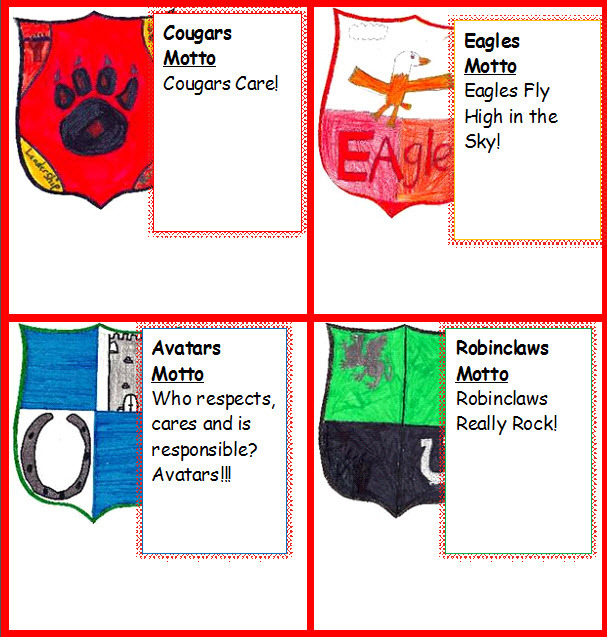 The crests and mottos were also selected by house member vote. House Leaders: Cycle 3 students act as Masters of Ceremonies at school assemblies, plan and implement fund raising activities and represent the student body. Variety Show: an afternoon and evening production showcasing the many talents of our students. Family Movie Nights invite families to come and watch an evening movie complete with popcorn and drinks in a family-friendly environment at the school. Halloween, Christmas and Spring Carnival days invite students to participate in various student led games and activities. Intramural sports program at lunch. Lunchtime activities are planned and supervised free of charge by the teachers. After school activities are provided by outside sources; parents pay various fees depending on the activity.